This is the last of my author interviews for November. I am blessed to have my ACFW Ohio Chapter. These writers encourage and inspire me. I hope you'll check out their books. Books make wonderful Christmas gifts and I'm sure you'll love the writing of today's author. 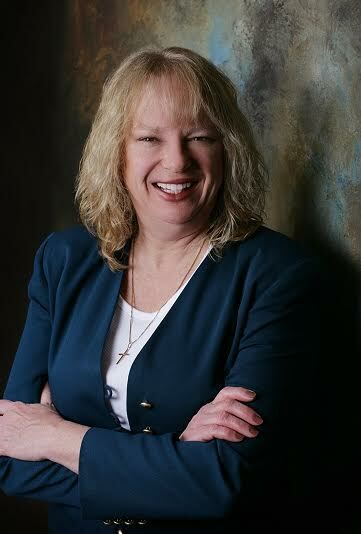 Rebecca: Mary, I think we first met at a retreat our Ohio Chapter of ACFW organized, right? Mary: I think you’re right. It was in a log cabin in the woods. A great place to write. Rebecca: And write we did. I put these interviews together so my readers can get to know some of their favorite authors as well as learn a bit more about the writing process. So here goes. How did you come up with the title for your newest release? Mary: It’s a double murder mystery in which both crimes are committed around midnight. The first murder happens in a stockbroker’s office overlooking the river. The second mystery is a cold case which happened years ago on a bayou in the Mississippi delta. 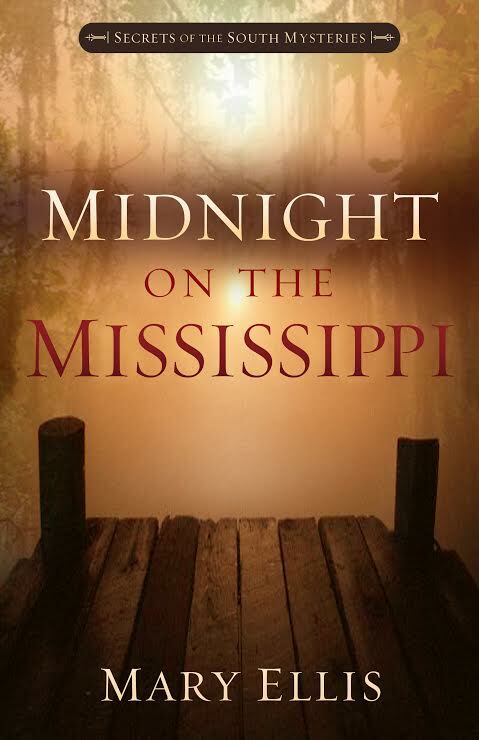 What better title than Midnight on the Mississippi? Rebecca: I love it and I think there is a real draw to books set in the South. So tell me, how long have you been writing? Mary: Goodness, a long time. I started 30 years ago, but gave it up because of family/teaching obligations. Then I took up the pen again around 15 years ago, and have been published for ten years. Rebecca: I think that is inspiring. So, Mary, where did you start and how did you get published? Mary: I wrote several books that I kept submitting on my own and received a string of rejection letters. It wasn’t until I met my agent at a writer’s conference and submitted my work to her did I catch my “break.” She had faith in my writing and found the correct publisher for my genre. We’ve been together for years. Rebecca: That has obviously been a very successful partnership. Here’s another question for you –one I’m often asked. Where do you get your story ideas? Mary: From travel, whether it be for my Amish stories set in the Ohio, or my historical romances set during the Civil War, or my current mysteries set in the South. My husband and I love to travel, and I discover fascinating spots to set a story wherever I go. Rebecca: I have more ideas than time to write, which leads me to my next question: How do you stay focused and keep disciplined in writing? Mary: I am under contract and have strict deadlines. Sometimes when I’m tired or the sunshine is beckoning I must place the due date for the book in big red letters above my desk. Otherwise I’d be tempted to goof off. Rebecca: A visual reminder. Good tip. I’ve asked this of some of our other writer friends and it has garnered a few comments. I think it’s relevant to my readers. How did you learn to write good dialogue? Mary: I eavesdrop on conversations. Honestly, I sit in coffee shops and restaurants and listen to conversations. Of course, I leave out any vulgarities or unnecessary slang, and if the people are talking private matters I stop eavesdropping. But I try to have my characters talk like real people. On to the next question. And thank you for being so patient. I know how valuable your time is. How do you approach describing a setting to your readers? I mean, do you use visual images or what? Mary: I usually visit each one of my settings first and take lots of photos. Then I look at my pictures before diving into a particularly atmospheric scene. 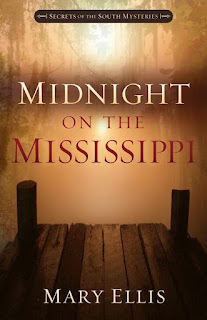 For instance, my current release, Midnight on the Mississippi, is set in New Orleans and the swamps of Louisiana. I visited many times to get my descriptions accurate. Rebecca: These next few questions are aimed at helping my readers who are new to this game. What was your biggest challenge after having your first book published? Mary: I had no idea how much marketing and promotion an author must do these days, whether she is traditionally or independently published. If I’m not careful, social media and publicity can consume more of my day than actual writing. Rebecca: I so agree! So, what was the hardest thing about publishing? The easiest? 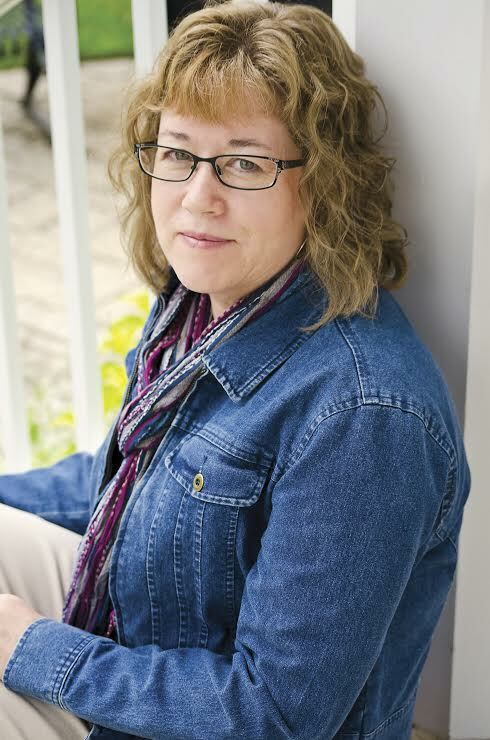 Mary: The hardest thing is being patient when the publishing world moves at a snail’s pace. Whether waiting on a decision from an editor, feedback from an agent, or an advance check in the mail, a writer must learn patience. The easiest? Working with my editor at Harvest House. She is a lovely person, besides a consummate professional. Rebecca: What advice would you give to aspiring authors for writing and/or publishing? Mary: Never give up. There is a niche for every writer who stays in the game. You must keep polishing and improving your work, even after you’re multi-published. Never stop learning your craft. Rebecca: That is excellent advice. Okay, to wrap this up, I want to ask you a couple of questions if I may, that are a bit off of the topic of writing, but help us get to know you as a person a bit better. Is that okay? Mary: Sure. This could be fun. Rebecca: What quality do you most admire in a woman? Mary: Independence. I admire women who aren’t sitting around waiting for doors to open because of their beauty, wealth, or family connections. I admire women who work hard for what they want in life, and are willing to delay gratification for the greater goal. Rebecca: I see you as that sort of woman. [Okay, that brought a smile to her face.] What do you do as a hobby? Mary: I love to read, work in my yard, and ride my bike. I would swim every day if we had access to a pool. But alas, we don’t so I settle for long, hot showers. Rebecca: [laughing] I guess you could get a deep tub. Here’s another question: Dogs or Cats? Which do you prefer? Mary: Uh…I have one of each and since they’re both in the same room here, I’d better not answer. Cats can be left alone for a day or two with plenty of food, water, and clean litter boxes, so I like their independence. But there’s nothing like the unconditional love a person gets from a dog. Rebecca: If you could choose to be a character in a book, who would it be and why? Mary: It would be Jo March, in Little Women by Louisa May Alcott. She was a writer who fought hard to get published during a very turbulent time in our nation’s history. She stood up for what he believed in and never gave up. Rebecca: Oh, me, too! I loved Jo. Thanks for answering those. But now, tell us a little about your latest book? Mary: I’d love to share a bit about Midnight on the Mississippi. Hunter Galen, is a New Orleans securities broker who suspects his business partner, James Nowak, of embezzling their clients’ money. After James turns up dead, Hunter realizes his unwillingness to confront a problem may have cost James his life. Nicki Price, a newly minted PI, intends to solve the stockbroker’s murder as she establishes herself in the career she adores. As she ferrets out fraud and deception at Galen-Nowak Investments, Hunter’s fiancée, Ashley Menard, rubs her the wrong way. Nicki doesn’t trust the ostentatious woman who seems to be hiding something. But is the PI’s growing attraction to Hunter—the police’s only suspect—her true reason for disliking Ashley? As Hunter and Nicki encounter sophisticated shell games, blackmail, and death threats both subtle and overt, danger swirls around them like the mysterious dark water of the bayou. Only their reliance on faith and fearless determination give them hope they will live to see another day. Rebecca: That sounds intriguing. Tell us a bit about your current project. Mary: I have just put the finishing touches on my second Secrets of the South Mysteries. In What Happened on Beale Street, a cryptic plea for help from a childhood friend sends cousins Nate and Nicki Price from New Orleans to Memphis, the home of scrumptious barbecue and soulful blues music. When they arrive at Danny Andre's last known address, they discover signs of a struggle and a lifestyle not in keeping with the former choirboy they fondly remember. Danny's sister, Isabelle, reluctantly accepts their help. She and Nate aren't on the best of terms due to a complicated past, yet they will have to get beyond that if they want to save Danny. On top of Danny's alarming disappearance and his troubled relationship with Isabelle, Nate also has to rein in his favorite cousin's overzealousness as a new and eager PI. Confronted with a possible murder, mystery, and mayhem in the land of the Delta blues, Nate must rely on his faith and investigative experience to keep them from getting killed. Rebecca: You are a writing machine! Thank you so much for participating in this! Readers, please leave you comments below. I know Mary would love to hear from you. I am thankful for my writer friends. If you are one of my regular readers, you know that for the month of November I decided to interview four Ohio writers from my ACFW writing group. They have been strong encouragers to me over this past year. We have laughed together, shared meals together, and served as “sounding boards” for each other. This is the perfect time to order a special book for someone you love for Christmas, so I bring to you, four very different books from four very different authors. I know you will learn a little something from each of them….Enjoy! Today’s special guest: Carole Brown. I first met Carole at a local event for ACFW in Cincinnati. We got to know each other better through the Ohio chapter meetings and at a writing retreat in Hocking Hills. She is fun and we accuse her of having a delightfully devious mind! I know you will learn from her and find her interesting. Rebecca: Okay, Carole, you’ve read the interviews I did with Rosanna Huffman and Cindy Thomson so you know what’s coming. How did you come up with the title for your newest release, Bat Crazy? Carole: Actually I’ve been asked this before! It’s the second book in my Denton and Alex Davies mystery series. I’d originally written Hog Insane, the first book, as a fun short story about a woman who always wanted to ride a Harley bike. Her overly cautious husband hung back. Later, after I decided it would make a great first book of a series, by playing on the “crazy” words, I could keep to a theme and provide fun and entertaining books which have an underlying thread of relationships. 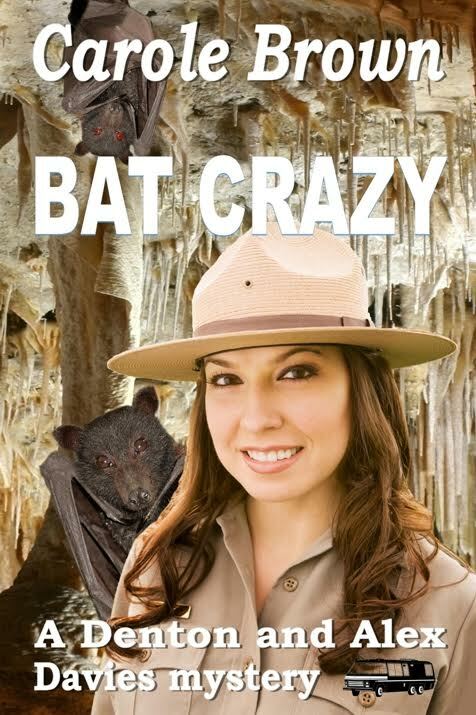 Bat Crazy is set in New Mexico where a famous cavern is found. I created a new cavern, added bats, and a mysterious problem, and voila--had a second book! Rebecca: I’ll leave that to my readers! Many of my readers are also writers. One question I often field is this: How do you stay focused and keep disciplined in writing? First, I’m an author who can work on more than one novel at a time. When I reach a roadblock (writing block! ), I move to my second novel and type away for however long I can. This method keeps me writing. Second, and this is more of a short term action, I take a lot of short breaks when I’m working. I might type out a scene, jump up to do a 15 minute kitchen cleanup, or make a phone call, or whatever. When I return, I’ve rested my eyes and my mind, and am ready to tackle a bit more writing. These methods may not work for everyone, but sometimes you have to use trial and error to find out what works to keep you motivated. One thing I know is, you have to keep writing. Expand your thinking. Have a list of “possibles” that could happen, handy where you can read over them and use if needed. No matter how blocked you feel, write. If you’re really having a tough time, brainstorm (by phone or person) with a critique partner, research, edit, relax. You’ll come back inspired and refreshed. Rebecca: Great tips. The dialogue in you books feels natural. Tell us how you developed that skill of writing good, believable dialogue? Carole: I’m an emotional, sympathetic (and empathetic) person. So when I’m writing I do my very best to actually place myself into the story. If I can feel the hurt, the embarrassment, the romance, then I’ve succeeded in creating dialogue that will place my readers right in the mood. I don’t want to be detached, watching from afar. I want to be that character (as hard as it may be to infiltrate an antagonist!) and live through whatever he is enduring or enjoying. Rebecca: Sure. I think empathy –putting yourself in someone else’s shoes is valuable in many walks of life, but yes, I see how it can help get in the heads of my characters. I think that’s what I do as well. My next question is about the setting. How do you approach describing a setting to your readers? Rebecca: A great quote! What is your favorite quotation? Carole: “Shoot for the stars and you may hit the moon.” That’s only one of them, and since I collect quotes like Kelloggs collects corn flakes, I have a lot of quotes I love. This one though, encourages the us to aim high because when you do your best, you’ll be hitting higher than you would have if you’d kept your gun pointed at the ground. Kind of simple, but true. Rebecca: I love it! I need to tweet that one! So, tell us a little about your latest book. Carole: I love this crazy, fun book for a lot of reasons, but I suppose one of the best--to me--is that hubby and I went through five deaths in five months at the first of this year. It was a difficult time for me, and I could barely write. BUT nothing lasts forever, and eventually inspiration hit. I finished the book, and it was much stronger because of it. We’ve traveled a lot in our life and visited New Mexico several times. We fell in love with the Native Americans living there, enjoyed the scenery and the privilege of working there for different periods of our life. I also realize many people do NOT care for bats. I didn’t either, but after research, I learned how beneficial they are to the environment, and how mostly harmless they are to humans. My fear has lessened and my respect has grown for them. But with support from the town detective--an admirer of the Davies--and their own tenacious personalities, Denton and Alex aren’t easily scared off. Not when warnings in the form of painted bats show up on the porch of their rented cabin, not when the mayor threatens to run them out of town and not even when Denton finds the bones . .
Rebecca: Thank you! So, you’ve already shared that you keep a number of books in the mill at once. Tell us a bit about your current project. Toni DeLuca, the Italian owner of DeLuca Construction, finds herself confronted with doubts about her father and his possible deceptions--all because of the mysterious pink notes she’s been receiving. Relations with Perrin Douglas who has a troubled history--but the first man in years who’s interested her--is building to a peak. Yet Perrin’s own personal problems and his doubts about women and God, keep getting in the way. Gossip, a Spanish proposal, an inheritance, and a sabotaged construction business may ruin Christmas for Toni’s employees as well as her happiness. Will a mysterious person succeed in pulling off the biggest scam Appleton, West Virginia has ever seen? And will this culprit destroy Toni’s last chance at happiness with the man of her dreams? Do keep in touch. I frequently offer deals and freebie promotions on my books. If all goes well, three new novel releases should happen in 2016! Rebecca: Thank you, Carole. I love your energy, quick wit, and incredible imagination! 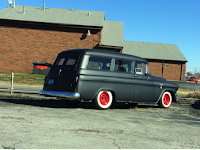 I really appreciate you appearing on my blog today. One day we’ll have to do this as a vlog so everyone can see you and hear you, too. Readers, be sure to leave your comments for Carole below. I know she would love to hear from you. I am thankful for my writer friends. 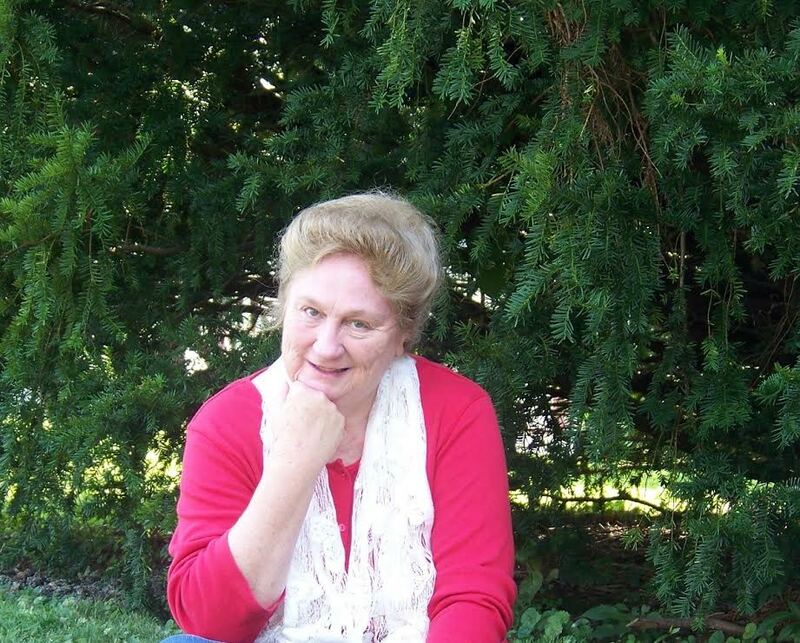 So….for the month of November I decided to interview four Ohio writers from my ACFW writing group. They have been strong encouragers to me over this past year. We have laughed together, shared meals together, and served as “sounding boards” for each other. This is the perfect time to order a special book for someone you love for Christmas, so I bring to you, four very different books from four very different authors. I know you will learn a little something from each of them….Enjoy! Purchase your Kindle version here: http://amzn.to/1NMYaw0 NOTE: The book is also available on Amazon in paperback. Now on with our interview! Yay! Rebecca: Cindy, last week I asked our friend, Rosanna Huffman how she came up with the title for her novel so I’m going to ask you the same question. How did you come up with Sofia’sTune? And let me say, I love the cover! Cindy: Thank you. I’m very happy with the cover, too. Actually, I directed this cover myself. It was designed by the talented Kim Draper and photographed by my daughter-in-law Kelsey Thomson, so it is very special to me. As for the title, I knew I wanted to use the advertising icon, His Master Voice, which was beginning to become popular in the era of my novel. And I knew my male character would be a Vaudeville musician, so I wanted something musical, but with a dual meaning. Sofia’s Tune refers to “changing your tune” or changing the direction of your life. 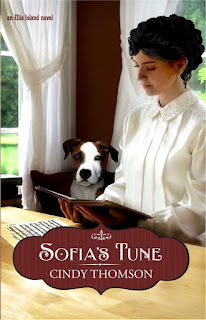 Being the third book in a series, it follows a pattern: Grace’s Pictures, Annie’s Stories, Sofia’sTune. Rebecca: How long have you been writing? Cindy: Trick question? I made up stories as a kid, and wrote stories in study hall when I was a teenager. Always a storyteller in some aspect. I began writing seriously with an eye on publication fifteen years ago. Rebecca: I’m seeing that a lot. Many of us tended to write stories as children. So, I know this will be of interest to my readers: Once you decided to take the writing seriously, where did you start and how did you get published? Cindy: My first published piece was on a web site that, by the way, no longer exists. I was paid $25! I continued on with magazine writing and published many pieces in genealogy magazines, which I continue to do today. But historical fiction has always been my passion. My first two published books came out in 2006. A historical titled Brigid of Ireland, and a baseball biography I co-authored with my cousin, Three Finger: The Mordecai Brown Story. Rebecca: I’m familiar with Brigid of Ireland, but must admit, I haven’t read the second one. Those genres seem so different! Where do you get your story ideas? Cindy: Oh, my. Ideas are everywhere! It amazes me that people ask this question a lot, but I suppose not everyone looks at life like I do. I took this picture yesterday and thought of story ideas. 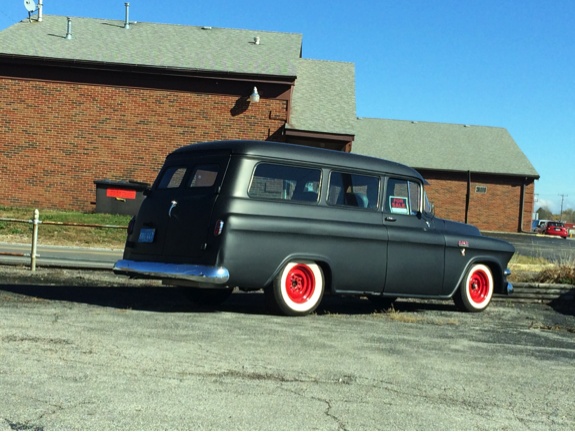 A getaway car? Something Bonnie and Clyde-ish, but not very successful because, you know, it has red wheels that stick out like a sore thumb! Ideas are everywhere, but mostly I get mine from the stories of our ancestors. There is so much inspiration in their tales to keep me writing for the rest of my life. Rebecca: [laughing at the red wheels] Kind of reminds me of a short story I wrote as a teen where the only clue was that the criminal had a moustache and the kid-detective solved it by discovering every suspect had a moustache except one…the guilty guy had shaved his off to try to disguise himself! I digress. Sorry. Let’s see. The next couple of questions are about the writing craft itself. Many of my readers are new to the writing game, so I know they’re always looking for strong advice from published authors. One question I’m often asked is how an author learns to write strong, believable dialogue. How did you come by that or what advice might you give new writers? Rebecca: Good advice. How do you approach describing a setting to your readers? I mean, do you use visual images or what? It’s really important to paint the scene so that the reader feels that he or she is actually in the story and participating in what’s happening. This involves using the five senses and showing how the characters feel and respond, rather than telling the reader how the characters feel. Readers need a sense of time, an idea of whether the place is perilous, comfortable and nostalgic, or adventurous. I was a mentor for the Christian Writers Guild for many years and their curriculum did a great job leading writers through this process. If you don’t properly set your story in the first paragraph or so you will confuse your readers. And no one wants that. Rebecca: I agree. If your readers are confused, they’ll put the book down. So…what was your biggest challenge after having your first book published? Cindy: The same as it is now with book seven: finding readers and introducing them to my book. In some ways it’s easier now than when I first started. Few people were reading electronically and Facebook was just getting started, as were personal blogs. Twitter and my first novel were born the same month. It’s much easier to reach out now, but with the vast numbers of books published each year growing at an incredible rate, it’s still hard to be heard above the noise. I’m constantly learning, though. It’s a challenge I’m taking on the best I can because after all, I write books so people will read them. Don’t rush to publication. It’s so easy to do today, and I see lots of people making this mistake when they decide to publish their own books. There is no substitute for a professional editor. Don’t skip this step, even though it’s expensive. By having six traditionally published books I learned how much good editing helps. A good editor makes you look a whole lot better. Don’t skip good design either. A bad cover can sink your book, and be sure to get opinions and don’t just rely on what you like. Someone else might see something you didn’t, and you want your cover to be appealing. Take lots of time in the process. One thing people complain about traditionally publishing is how long it takes to get your book out. It’s true. It can take a year or two. But that’s because several rounds of editing are taking place, and more than one person is checking for mistakes and giving feedback about covers, and lining up pre-publication reviews. In my opinion an independently published book should go through the same things, and that takes time. Remember what your parents told you growing up? Rushing through a task results in mistakes. Absolutely true in publishing. Rebecca: Okay… Let’s try a fun question. Dogs or Cats? Which do you prefer? I’ve had both. However, I’m glad you asked because Sofia’sTune has a very important character, a dog named Luigi. When I thought about the characteristics of a really good dog, I realized we could learn something from them, especially when it comes to listening to the master’s voice. Rebecca: I love it! And how clever of you! That brings us back to Sofia’s Tune and this question: What is one take-away from your book you hope readers will identify with? Cindy: To look at life’s challenges from different angles. The Italian immigrants I write about had preconceived ideas about how life should be. Some of it was good and worth keeping, but some resulted in keeping secrets that harmed instead of helped. Changing your tune is sometimes the best strategy to overcome a problem instead of just accepting defeat. Rebecca: Cindy, as always, it is great to talk with you and pick your brain about writing. It’s part of what I enjoy about our ACFW Chapter meetings. Your turn: What are you learning from these interviews? How has Cindy encouraged you as a writer or reader today? We want to hear your thoughts. Leave your comments in the section below. I know Cindy would love to chat with you.